'Wireless Capability' enabling use with Kidde Fyrnetics new Wireless Alarm Base (Model: RF-SFTP), for wire-free interconnection. Green & Red LED's to indicate alarm status. Interlinkable with Kidde hard-wired CO alarms using 'Smart Interconnect' technology. Designed specifically for social and private housing, Kidde's Slick and its series are the range of fast-fit rechargeable ionization alarm for optical smoke and heat which are guaranteed for 10 years. All types of Slick alarm are BSI Kitemarked to toughen the consistent quality provided by the largest manufacturer in the world. Both models are equipped with backup power, according to the minimum requirements of corresponding Building Regulation for new housing, i.e. Grade D (BS5839, Part 6). 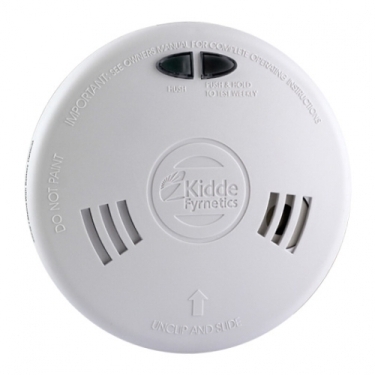 Optical Smoke alarm is used in escape and circulation tracks and in areas where the combustion of furniture exist and surroundings by cigarettes. They are best suited to slow, grounded fires such as PVC cabling, foam-filled furniture or covered material. The alarm is more difficult than Ionisation alarms for prone from cooking materials and steam near kitchens. 2SFWR - with rechargeable Lithium cell back-up and full 10-year guarantee. 2SFW - with Duracell loose alkaline battery back-up and 6-year guarantee.